1. Eat pasta for brunch on Saturday, then naan pizza for brunch on Sunday. Brunch is still booming: Park Slope’s Fausto will get in on the action on May 5, followed by Floyd Cardoz’s Bombay Bread Bar on May 6. Fausto will keep it Italian with dishes like black-pepper tajarin ($22) with pancetta, ramps, and egg; and braised duck leg ($22) with polenta, poached egg, and pea greens. There’s also a promising new breakfast sandwich ($16) to add to the rotation, this one on ciabatta with sausage, Fontina, and ramp pesto. In Manhattan, Cardoz will put his carb skills to good use. Excitingly, he’s adding a rice dosa ($18) to his menu; this one comes with eggs, chili, and garlic chutney. 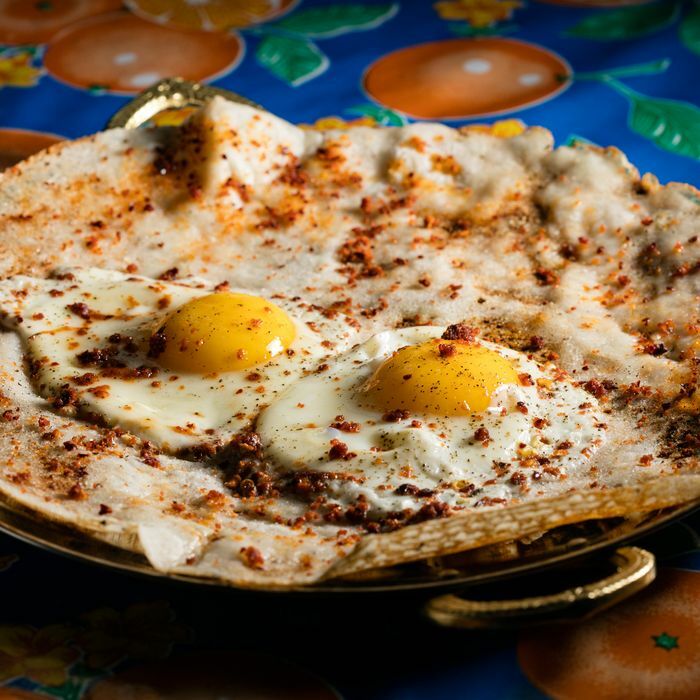 He’s also turning the restaurant’s bacon-cheese naan into a naan pizza ($17) topped with fried eggs, taking on the Bombay street food the frankie wrap ($16), made here with chicken tikka; and stuffing the bread called pao with lamb keema ($19). 2. Go to a special mole dinner cooked by a chef from Puebla. Not able to book a casual trip to Puebla anytime soon? The next best thing might be happening right here in New York. On May 2 and 3 (dinner is $65), Williamsburg restaurant Casa Pública will host Margarita Villegas Leal, a cooking instructor and chef in Tlatlauquitepec, Puebla. What makes this particularly exciting is that Leal is not just another chef on the international circuit, but someone whose cooking would normally require a trek to enjoy. A collaboration between Leal and Pública’s chef Bob Truitt, the five-course dinner includes four kinds of mole. There’s pipian verde with sea bass and squash blossoms; mole rojo with torta de camarón; mole poblano with braised duck, fava beans, and leaves; and finally, a dessert of sweet mole ice cream with cookies. Some of the proceeds, too, will go into Leal’s pockets to help support her business. 3. Get your Korean-fried-chicken fix every Monday. On Mondays, Korean barbecue palace Insa will throw a fried-chicken-and-beer-palooza that they’re calling Chimek Monday. The bird will, of course, be Korean-style and served with a pitcher of beer. The cost is $30 for a half-chicken or $50 for a whole. And if you don’t gorge yourself into a food coma, you can belt out a few songs in one of their karaoke rooms, which, as it so happens, are 50 percent off Mondays through Wednesdays. 4. Attend a League of Kitchens dinner at the James Beard House. On May 4, the James Beard House hosts the League of Kitchens for a second collaborative dinner (for $175). That evening, they’re bringing in Damira Inatullaeva, the League of Kitchens instructor for its Uzbek cooking class. Inatullaeva has a charming personality and easygoing optimism; she’s exactly the sort of person whose house you’d want to dine at. (Though the price tag is obviously much heftier than what you’d pay at, say, Nargis.) The menu includes a slew of hors d’oeuvres, like pan-fried squash-dill pancakes and traditional Uzbek sausages with mint and Armenian cheese, and dishes like baked pumpkin sambusas with eggplant salad; rice pilaf with beef and labneh; and a sour-cream pastry with layers of walnut. 5. Go to the opening party for a rooftop bar you’ll actually like. If you can’t get out of the city for Memorial Day weekend, you can at least get above it. The owners of Bushwick’s Elsewhere are throwing a party then to celebrate the opening of their rooftop bar, the latest addition to their 24,000-square-foot venture. Frozen drinks, barbecue, live music, and DJs are all promised just in time for the start of day-drinking season, and more information on the party’s lineup will be sent out to those who RSVP here. The buildings won’t be — for now, anyway — inhibited by taller ones nearby, so it offers relatively unobstructed views of the Manhattan skyline. That’ll be a plus, no doubt, during the sunset happy hours, part of an activities slate that includes weekend food pop-ups, art programming, and a solid lineup of summer shows with acts like Negative Gemini. 6. Have a blowout lobster-and-Champagne meal on a boat. Speaking of nice places to enjoy warm weather, restaurant-on-a-boat Grand Banks returns for the season starting tomorrow. It’s back with a bigger menu (see here) — though, don’t worry, the lobster roll hasn’t gone anywhere. The new dishes include those in the “epic” section, and those looking to get extravagant can go for, say, the lobster-and-Champagne meal (a doozy at $200), with two lobster rolls, a bottle of Perrier-Jouét Grand Brut champagne, and obviously, French fries. Other new additions include a caviar latke ($20) and seared sea bass in ramp-and-bacon broth ($24). 7. Eat a dinner cooked by newly minted James Beard Award winner Michael Twitty. Claus Meyer’s socially conscious Brownsville Community Culinary Center will launch its own guest-chef series. First up to bat is Michael Twitty, fresh off of two James Beard Foundation awards for The Cooking Gene, a memoir about race and southern food culture. Twitty will drop by from May 8 through 10, when he’ll lecture students, perform a kitchen demo at Brownsville’s Marcus Garvey Apartments, and cook a dinner on May 9 (tickets are $75) inspired by his book. Sales from the dinner will benefit the Melting Pot Foundation and BCCC. 8. 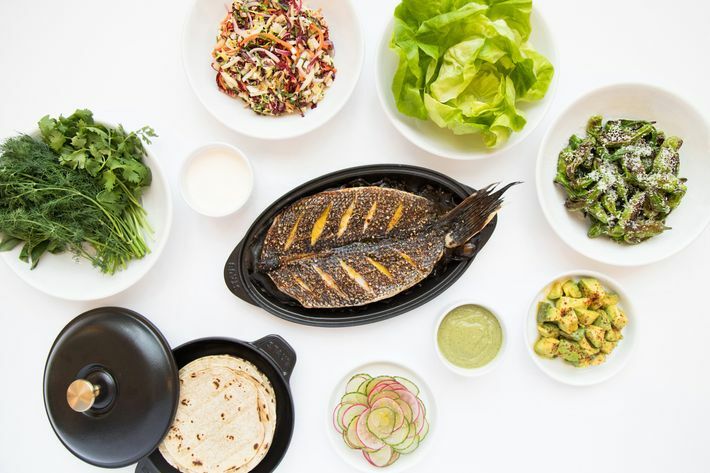 Have Daniel Humm’s fish tacos in the Hamptons. Reservations go live today and dinner has been announced for the Eleven Madison Park Summer House (menus here), returning to the Hamptons May 25. Both the outdoor patio and inside dining room will serve snacks like pizza bianca with charred squid, chili, and fennel ($24), as well as flatbreads topped with clam and bacon ($23) or corn and truffle ($24). As with last year, they’ll also serve pricey status dishes for six to eight people, too: a whole fish ($95 a person) for tacos, another taco option in beef short rib ($120) braised on the bone, and a lobster boil ($125) with Parker House rolls and a seasonal pie. Inside, you’ll be able to dine on garganelli with sausage and tomato ($32), and bouillabaisse with black bass and shellfish ($47). 9. Watch short films about Puerto Rico and drink a cocktail for a cause. ﻿On May 15, dinner-and-a-movie theater Nitehawk will show seven short films by filmmakers from Puerto Rico and of Puerto Rican descent. For Fuerza Puerto Rico, they’ll show shorts about a young Puerto Rican man who’s homeless in New York, the island’s cockfighting culture, a gay working-class woman who meets her father for the first time, and more. The event will raise money for Apoyo Empresarial Peninsula Comunidad de Cantera’s continuing efforts to provide relief from the lingering devastation of Hurricane Maria. There will also be a special cocktail in the Amigo de La Compasión (Puerto Rican rum, Giffard Banane, lime, and orgeat), all of the proceeds from which will go to the charity. 10. Go to an all-things-lamb dinner at the Four Horsemen, or one with Cesare Casella at Barano. There’s a trio of fun special dinners happening in Williamsburg this month. Lee Desrosiers, the former chef of Achilles Heel, will return to New York to cook with Nick Curtola at the Four Horsemen. From 5:30 p.m. to 11 p.m. on May 9 (walk-ins and reservations), they’ll celebrate all things lamb with à la carte offerings. Lamb-tongue salad, ragù with polenta, and lots of spring vegetables like asparagus and ramps. The following week on May 15 will be the next winemaker dinner, this time with Domaine Prieuré-Roch’s Yannick Champ. The menu for the four-course meal ($325, reservations here) with seven wine pairings is still being determined, but the pours will include, apparently, back vintages that laypeople don’t usually have access to. Also in Williamsburg, Barano’s Al Di Meglio will host Cesare Casella for a six-course meal (dinner is $75, wine pairing $30) on May 8. Casella became one of the city’s most famous Italian chefs, but New Yorkers have been unable to regularly eat his cooking since he left Salumeria Rosi three years ago. It’s a rare chance these days to eat his food. 11. Go to a late-night, altruistically minded mezcal tasting at Atla. There’s more mezcal to drink, too. On May 6, hip downtown Mexican restaurant Atla will bring in Brooklyn’s Madre Mezcaleria for a late-night mezcal tasting to benefit Sacred Agave. From 10 a.m. to 1 a.m., they’ll pour 12 different mezcals from Rezpiral, so you’ll get to try plenty of different expressions. All proceeds will go to Sacred Agave, which raises money to better the lives of people in rural Mexico by helping build libraries, replant agave, and more. 12. Then geek out about mezcal and tequila at the Museum of Food and Drink. For its Wild Foods and Spring Spirits 2018 series, the Museum of Food and Drink will dive deep into the world of Mexican booze with Secret Science of Agave Spirits on May 10 (starts at 6:30 p.m., tickets are $35). Leading the discussion will be Rachel Meyer, whose uniquely qualified to do so. She’s not only a botanist and the University of California Conservation Genomics Consortium’s executive director but the co-owner of Shoots & Roots Bitters. On the menu: current knowledge of production methods and how research and traditional knowledge in Mexico can inform our understanding of how climate change might affect these boozy traditions. Drinks will be served in the form of straight agave spirits and cocktails from Don Lee, who’s opening a new bar with MOFAD’s Dave Arnold. 13. Feast at the Harlem EatUp! festival. On May 14, Marcus Samuelsson’s uptown food festival Harlem EatUp! returns for its fourth year. There are six days of events to attend, including the Harlem Stroll in Morningside Park at 12:30 p.m. on May 19 and 20. You can get free admission or pay $85 for the Ultimate Grand Tasting, where you’ll have access to food from 20 neighborhood restaurants, including Charles’ Country Pan-Fried Chicken, Bo’s Bagels, Melba’s, Miss Mamie’s Spoonbread Too, and more. (The lineup differs each day.) Tickets are still available to some of the Dine In series dinners, like the May 16 one (tickets are $95) with Solomon & Kuff’s Christopher Faulkner and River Bistro’s Maxcel Hardy.